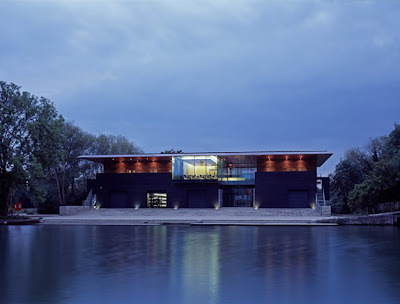 Glossy mag Architecture Today has featured University College's spiffy new boathouse on the banks of the Isis (as Oxonians call the Thames as it flows through their city). The article is interesting in that it gently exposes the way the college seems to have muscled in on the boathouse and rather marginalised the rowing club. The clubhouse on the first floor, for example, has been grandified to give the college a classy function room with river views where they can entertain notables they want to impress. Unfortunately this means the rowers don't feel comfortable in their own clubhouse. And a flat for postgraduate students has been included, partly for the good reason that a 24hr presence might deter the type of arson attack that destroyed the old boathouse. But none of the new residents are rowers. Finally, the money having been spent on the hospitality suite, the gym, changing rooms and other facilities for the rowers have been decorated in a very utilitarian breezeblock finish. The building sure looks good, though, with its copper roof designed to look like a blade cleaving the sky. It was designed by Belsize Architects, who also entered a recent competition to design a boathouse for Lea Rowing Club in East London. Thanks to The Rowing Service for the heads-up. A threat to boating. Or possibly its saviour.